Paudie Coffey got into a bit of a row on the radio this morning. 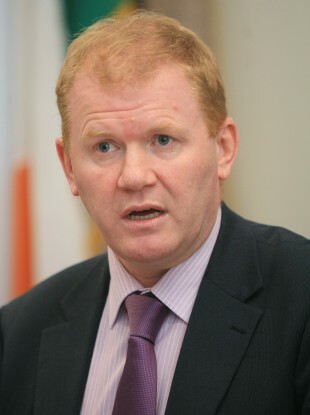 THERE WAS HEATED discussion on the airwaves this morning as Fine Gael junior minister Paudie Coffey defended the government’s belief that more people will pay their water charges into the future. Speaking to Audrey Carville on RTÉ’s Morning Ireland, the junior minister at the Department of the Environment said it is very obvious the Eurostat decision yesterday was very marginal. Yesterday the The European statistics agency Eurostat said Irish Water has to remain part of the Exchequer’s accounts. This is due to the government’s failure to prove to the agency that half of Irish Water’s revenue came from customers alone. He admitted yesterday’s decision was “unexpected”. Coffey was asked why customers who have already paid would not go about cancelling their direct debit to Irish Water today. “I would urge all people to continue paying and I know they will,” he said. Figures published earlier this month revealed a 46% compliance rate from customers, relating to charges collected during the first three months of this year. While he said the government did not pass the Eurostat 50% test this year, he said he’s “very confident” of passing it next year. He said the figures of those that have paid continues to rise. When pressed on what percentage the figures had risen by over the last couple of weeks, Coffey said it “is increasing by the day”. It is actually. It’s 43% and increasing…There is no doubt that more people have paid since. I cannot give you the figure this morning, but when Irish Water give the next report, you will see more people will have paid at that stage. Later this afternoon a Department of the Environment spokesperson told TheJournal.ie Coffey had not actually seen any numbers for the period in question. Minister Coffey has not seen revised figures from Irish Water, however it is reasonable to assume that as over four weeks have passed since the 30th June deadline for registration, more people have registered. There is no alternative to what is being proposed… we are going to end up with far more serious problems down the road… All those people not paying at the moment won’t thank this government or any other government if we don’t act now.Irish Water is here to stay. It is the only way we are going to be able to provide quality water in to the future. He took issue with the insinuation made by Carville that Eurostat found Irish Water policies and the establishment of the utility are not working. The government aren’t the only ones to have concerns; the Central Statistics Office also raised issue with the data used in reaching the decision, he said. He said the government’s plan is fair and sustainable and will provide a water system fit for purpose into the future. The minister said the successes of Irish water had been seen in areas such as Roscommon where there is now drinkable water again. He said investment is needed in the water services to tackle river pollution and Dublin’s capacity issues. Coffey said without this investment, hotels, businesses and homes in the capital will have water problems within a year or two. Email “Junior Minister claims Irish Water registration is "increasing by the day" - but hasn't seen registration figures”. Feedback on “Junior Minister claims Irish Water registration is "increasing by the day" - but hasn't seen registration figures”.